I know this sounds a little over the top, but trust me when I tell you it may be one the the most amazing things you will ever try. This whole idea came up when me and my friend Dave sat trying to come up with something that we thought no one has ever done before. I later realized we were not the fried rib pioneers. At first we wanted to treat the ribs like chicken wings. Hmmm…. lets call them “Hawgs”! YEAH!…and… we can make t-shirts… and…and… sell them!!!!. Did I mention that we were drinking when we starting our brainstorm? Anyhow. 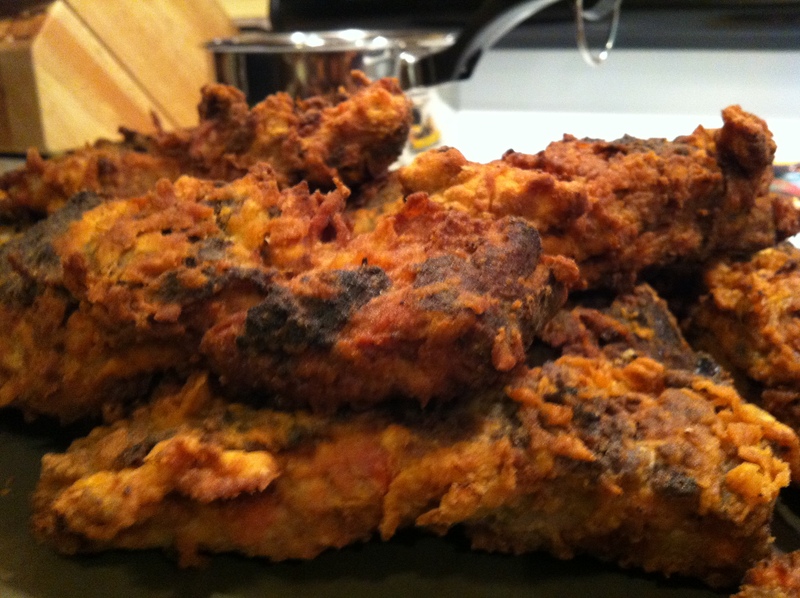 Here is our take on fried ribs. We started the day by firing up the smoker, we used charcoal/wood and applewood sawdust that was soaked in apple juice for about an hour. I seasoned the ribs with a dry rub combo of salt,pepper,garlic powder,paprika, cumin and chili powder, very basic. I allowed the ribs to sit overnight in the fridge with the dry rub on them. I find that this gives a deeper flavor to your finished product. 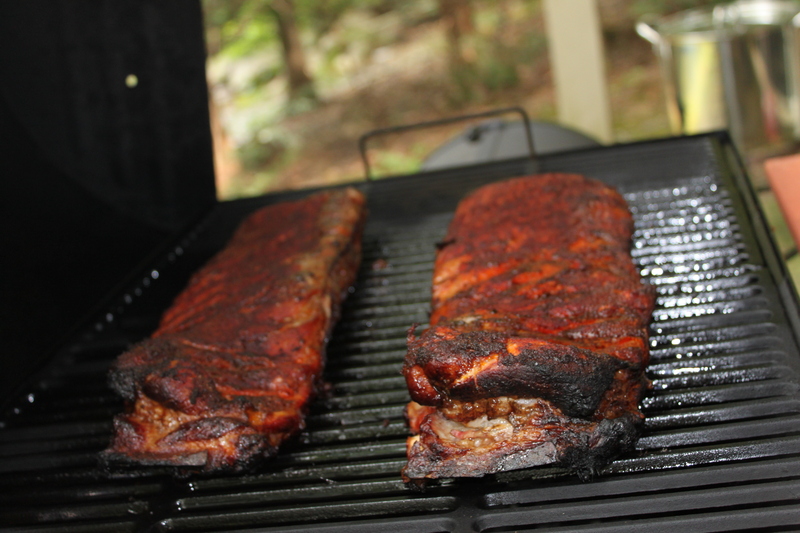 We let the ribs smoke for close to 5 hours, just to the point of meat sliding off of the bone. The key is to get them at this point, because if they go to long and the meat DOES start to fall off you will have issues trying to batter and fry the ribs. 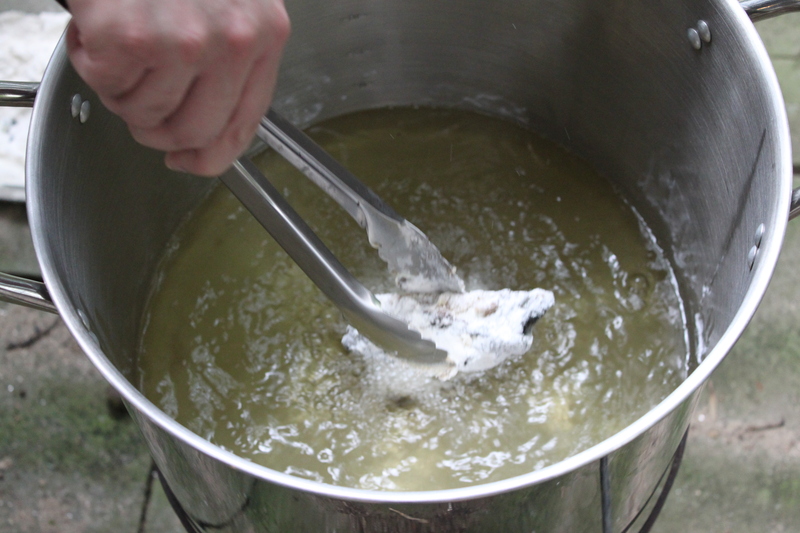 We did a simple milk, flour, salt/pepper/powdered garlic mixture. 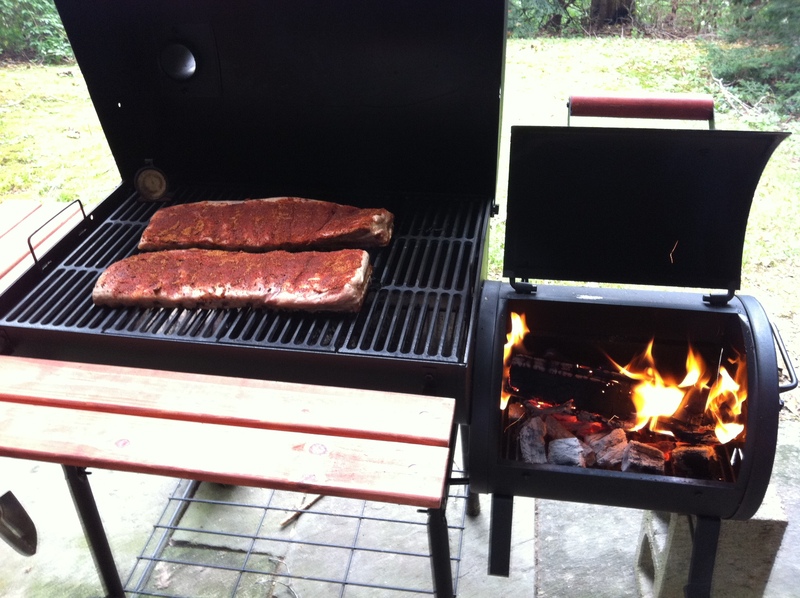 We did this part of the process twice just to be sure that the ribs were totally covered. This was incredibly messy. I set up a table outside as to not destroy the kitchen and make my wife want to kill me. 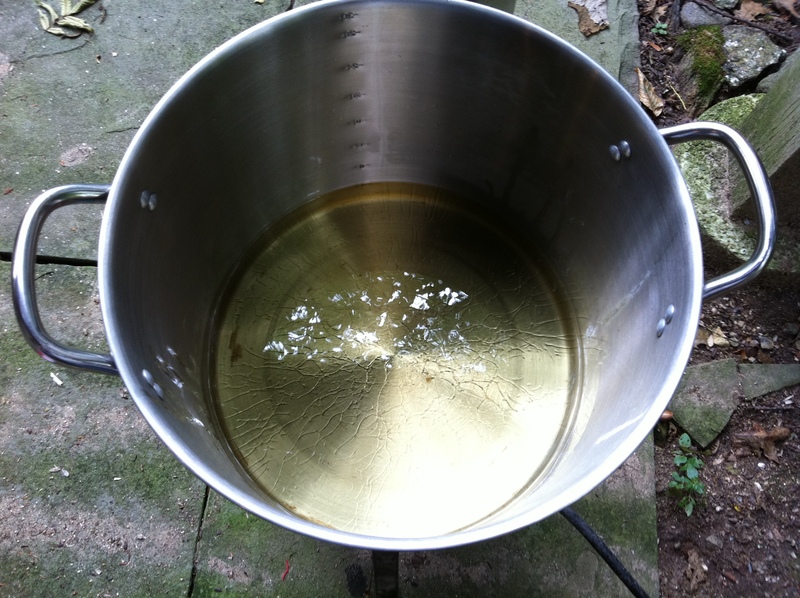 When it came time to fry the ribs we used a turkey fryer with peanut oil. The oil was a little pricey but in my opinion was the best option. Be safe when frying anything, turkey fryers have a bad rap for burning people’s homes down and causing havoc in general. The one regret I had about making these ribs is I didn’t have a deep fry thermometer, looking back I think this is a crucial tool to have. Period. So I ended up sacrificing a few ribs to be sure we had a good temperature, this meaning that the oil was hot enough to fry and the ribs would not act as a sponge and just absorb the oil. The next step we did after the ribs were done was we created sauces. My favorite was the hot sauce that we made. Fresh hot chilies ( we used 2 Thai chili’s), garlic, ketchup and for a little smokiness dried ancho chili’s that I rehydrated earlier in the day. 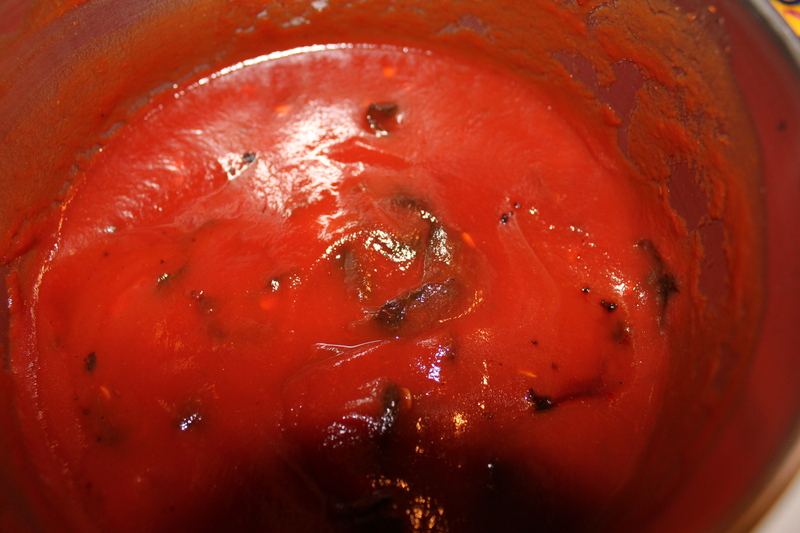 After we cooked the sauce down a bit, we ran it through a food processor to get a nice smooth well blended hot sauce. This what it looked like right before it went into the food processor. 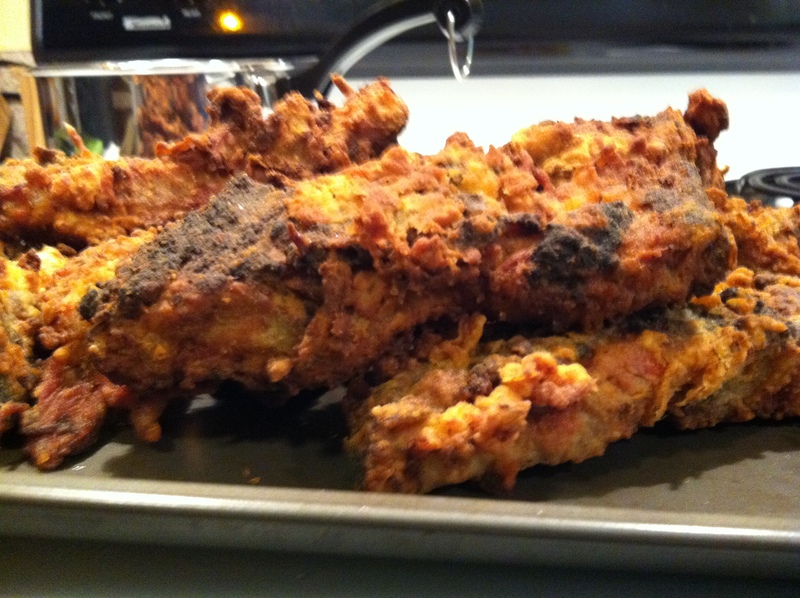 If nothing else Fried Rib Day is a great excuse to get together with friends, cook, drink and eat some amazing food. This was the second annual Fried Rib Day and we plan on keeping this tradition going. I hope this sparks some ideas on other foods to deep fry, because everything’s better when it’s fried. This entry was posted in pork, smoke, technique and tagged frying, pork, ribs, smoke. Bookmark the permalink. 2 Responses to Fried Rib Day!! Awesome idea and post, Chris! Will definitely have to give this a try. Did you think about going boneless (ie. let them fall off the bone, then fry)? Nicely done Chris!! They look as good as they tasted! !